“We owe it to the city to acknowledge both its beauty and its warts. In the process, we must all become stakeholders in the city, no matter whether we live here permanently or for a short period of time. 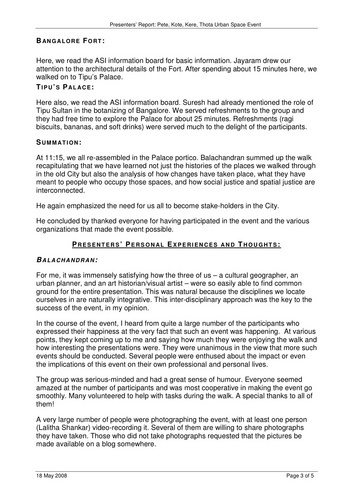 We owe it to the city for the opportunities it has given us”, said the organizers. 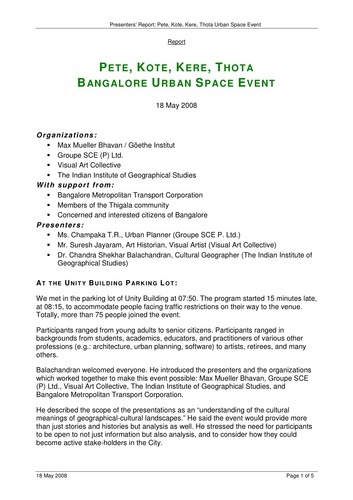 This urban space event will explore the changing landscapes of the old city area using four components: paytay (commercial area), kotay (fort), keray (tank), and thota (grove). Some of these are present in some form or other, the others are recollected. 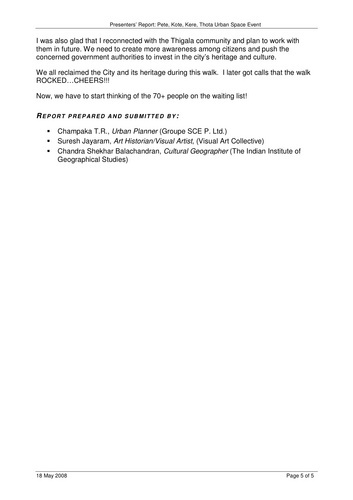 It will be conducted by T.R. 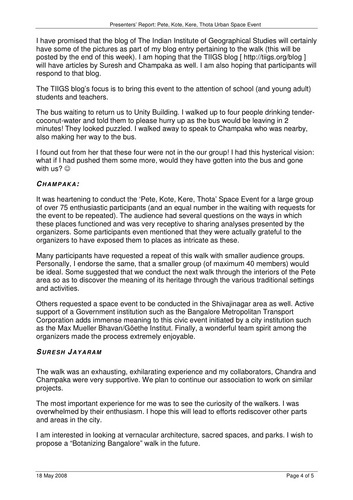 CHAMPAKA (an urban planner), SURESH JAYARAM (a visual artist and art historian), and CHANDRA SHEKHAR BALACHANDRAN (a cultural geographer). 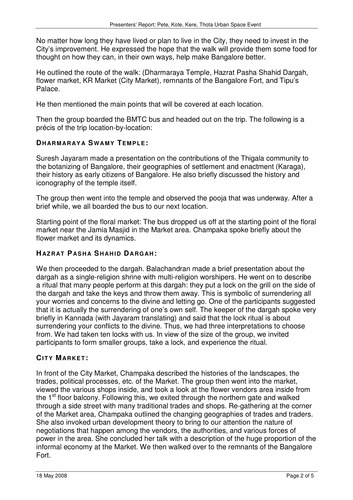 Beginning with the Dharmaraya temple in Thigalara paytay and the landscape of a community that played a key role in the botanizing of Bangalore, we will walk to the bustling, dirty, colourful, complex space of the K.R. Market (“City Market”). Along the way, we will visit an interesting sacred space bang in the middle of all the problematic spaces of the Market. 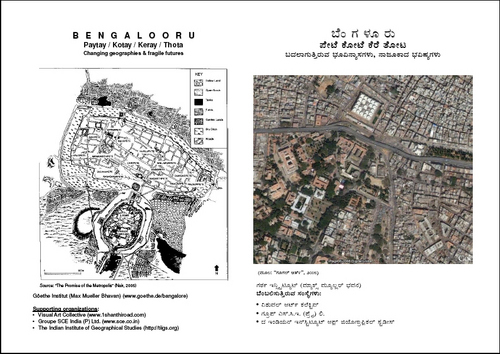 From there, we will visit remnants of the old Fort before finally visiting Tipu Sultan’s palace. Here we will have a lively dialogue. After that we will refresh ourselves with some quintessentially Bangalorean food. Come with us on this walk. Look at the un-romantic, but vital, life of Bangalore in the old city centre. The entire spectrum from the sublime to the crass, all jostling, vying for space, and playing out day in and day out. 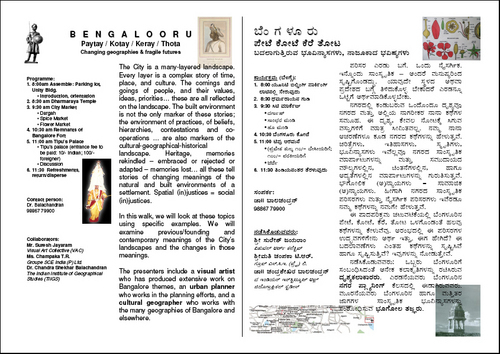 Bangalore will never appear the same to you again! The event is free and open to all but registration is required. Maximum capacity: 25-30 people. For more details and to register, please call the Goethe-Institut/Max Mueller Bhavan (080 2520 5305/6/7/8) or SMS WALK to 98867 79900. The event will begin at the parking lot of UNITY BUILDING, promptly at 8.00 a.m. Please be on time! Bring bottled water and exact change of Rs. 10/- (for Indian nationals) or Rs. 100/- (for foreign nationals) per person for entry to Tipu’s Palace. Wear sun glasses (shades), a hat, and comfortable walking footwear.